Scott Gibson, Glasgow’s own critically-acclaimed and award-winning son, returns to the Beacon with his BRAND NEW show White Noise. 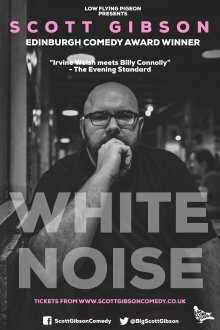 An all new show, fresh for its run at The Edinburgh Fringe Festival, delivered in his breathlessly inimitable and darkly comedic style, White Noise threatens to cover everything from depression to love, mental health and dugs, and the pursuit of happiness in the age of social media. How do you cut through the white noise?